The Mazzini-Garibaldi Club was founded in May 1864 as La Società per il Progresso degli Operai Italiani in Londra under the joint presidency of Guiseppe Mazzini and Guiseppe Garibaldi. La Società served the purpose of harnessing nationalist feelings among the Italian immigrant community in London at the time, thereby aiding the cause for the nationalist liberation of their homeland. La Società, Mazzini's brainchild, reflected his core political principles of fraternity, education and love of country. Initially, La Società was invited to meet at Mazzini's house in 5 Hatton Garden, London EC!, in London's "Little Italy", before moving to 106 Farringdon Road, then, in 1877 to 10 Laystall Street. From these premises, La Società sought to aid the allies in WWI by calling on Italian workers in London to aid the war effort. In 1930, La Società moved to 51 Red Lion Street. The Red Lion Street premises were confiscated between 1940 and 1945 and placed in the hands of the Custodian of Enemy Property. Many Italian men were interned as enemy aliens, interned and deported on the SS Arandora Star, which was torpedoed off the North West coast of Ireland on 2nd July 1940. 241 London Italians, mostly working men with no political leanings whatsoever, are known to have died in the tragedy. Click the image below for the Arandora Star page, including details of events to mark the 75th anniversary of the tragedy, with press release and hi-res photographs. After WWII, La Società recovered its premises, changed its name to Mazzini-Garibaldi Club Limited, and enjoyed a wonderful heyday in the 1960s and 1970s. The Club's function as a meeting place declined as City property prices soared and London Italians moved away to the suburbs, The Club sold its premises in 2008. It continues its social functions in keeping with Mazzini's principles, and acts as an historical reservoir of archives of the first Italian community, now housed in the Camden Local Studies and Archives Centre. The proceeds of the sale were deposited in a charitable trust, The Mazzini-Garibaldi Charitable Foundation, which makes grants to (primarily) the London Italian community for the purposes of education, medical assistance, art, etc. In 1912, the Mazzini-Garibaldi Club led the appeal to raise funds for a memorial to the 241 London Italians who died in the Arandora Star tragedy. The memorial, in St Peter's Italian Church, Clerkenwell, was dedicated on 2nd July 2012, the 72nd anniversary of the tragedy. 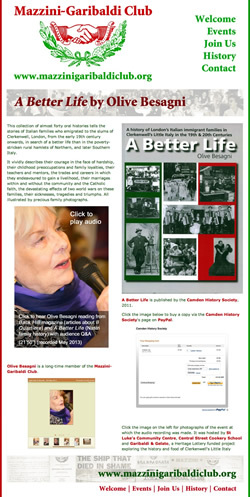 Mazzini-Garibaldi Club member Olive Besagni has written a fascinating book, A Better Life, that sets out the history of the Italian community in London, based on first hand interviews and family memorabilia. Click right for further details on Olive's page, which also features an audio recording and a link to the Camden History Society website, where you can buy copies of the book.